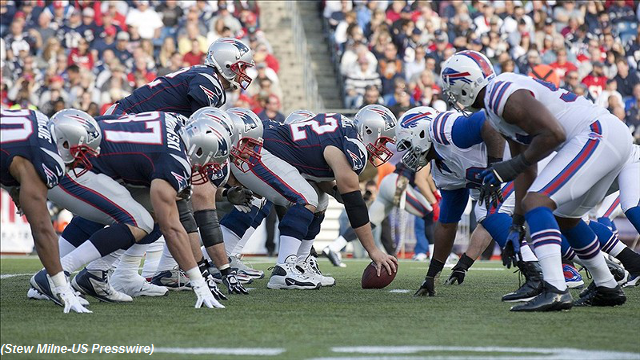 The New England Patriots sit at 7-2 during their Bye Week, having won five in a row after a rocky 2-2 start. A primary culprit in that first month was the play of the offensive line and their inability to protect the quarterback. Has New England fixed what’s in front of Tom Brady? The New England Patriots starting offensive line, consisting of left tackle Nate Solder, left guard Dan Connolly, rookie center Bryan Stork, right guard Ryan Wendell and right tackle Sebastian Vollmer, continues to progress each week. By establishing continuity, the unit has gained confidence, grown trust amongst themselves, and, most importantly, executed on a more consistent basis. Let’s revisit the path this group took to reach their current level of protecting Brady. Before training camp started, members of the Patriots’ offensive line headed into the summer knowing things would be different from previous seasons. After a 30-year tenure with the franchise, assistant head coach and offensive line guru Dante Scarnecchia announced his retirement. Continuity among offensive linemen is often considered to be as important as talent, and Scarnecchia’s aura helped unit after unit find success as the first line of defense in front of Tom Brady for the past thirteen years. Undrafted free agents (Stephen Neal) and late-round picks (Dan Koppen) were “coached up”, while high draft picks (Matt Light) usually panned out. The Patriots replaced Scarnecchia with former Jets offensive line coach Dave DeGuglielmo, a 9-year coaching veteran in the NFL, but still a young pup compared to the shoes he had to fill. However, a new coach would not be the only change impacting the unit for the 2014 season. The offensive line underwent another major shakeup following the trade of longtime starting left guard Logan Mankins to the Tampa Bay Buccaneers just weeks before the start of the regular season. The shake up of the offensive line resulted in a game of musical chairs early in the season. Only LT Nate Solder and RT Sebastian Vollmer remained a consistent presence early in the year, as the Patriots utilized eight unique line combinations through the first quarter of the season. Heading into Week 1, many believed that the Mankins trade had created an opening for second-year reserve guard Josh Kline to become a starter; however, a different second-year lineman, Jordan Devey, received the surprising nod at RG. Last year’s starting center Ryan Wendell found himself in a reserve role while Dan Connolly, last year’s RG, replaced him at center. Marcus Cannon, who had previously seen the majority of his NFL snaps at tackle, was handed the starting gig at LG. The new line combination struggled throughout their Week 1 matchup against the Miami Dolphins, especially in the second half. In all, Brady was hurried relentlessly, hit six times, and brought down for four sacks including two strip-forced fumbles. Here, Cannon is matched with defensive tackle Jared Odrick (#98), who defeats the third-year guard with a swim move to the inside, collapsing the pocket in two seconds and forcing the incompletion from Brady. This was one of many protection breakdowns on the day as further highlighted in Mark Schofield’s recap of the disappointing loss to Miami. As shown above, the Raiders attempt a common line stunt in which the right defensive tackle will cross paths with the left defensive tackle, exchanging gaps to attack. Even though the stunting defensive linemen initially trip over each other, both are still able to overpower Cannon and Connolly, while Devey is pushed five yards into the backfield on a simple drive block by his man. With pressure up the middle giving Brady no chance to survey the field, or to step up into the now non-existent pocket, the QB has no time to find tight end Rob Gronkowski sitting open 10 yards down the middle of the field. Instead, he has to rush an incomplete throw to wide receiver Brandon LaFell running a shallow drag route, avoiding a sack by the narrowest of margins. In the clip above, Vollmer (on left) displays poor technique. Right off the snap, we see issues with his first step. When facing an outside pass rusher aligned wide, tackles are taught to take a kick step back with their outside foot and then position their body square to the line of scrimmage with their back to the quarterback. The tackle should keep a low and wide base and shuffle off the line with his hands ready to punch the approaching defender’s chest. However, Vollmer’s kick step is stiff and doesn’t allow him to transition into a fluid shuffle. By comparison, Solder (on right) displays better technique in this regard, though both tackles fail to get their hands inside the numbers of their respective defenders. Solder is bailed out by inside help (which the pass rusher still defeats) while Vollmer gets no assistance and is beaten to the outside. To compound the issues on the perimeter, Brady has no ability to step up into the pocket due to pressure up the middle, and also no chance once he escapes the pocket. Connolly, who recognizes that Antonio Smith (#94) has dropped into a short zone, is late to provide Devey with help. Although they manage to momentarily delay Justin Tuck (#91), he eventually manages to hurry Brady outside the pocket and forces the incompletion. In Part 2, protecting Brady from the Kansas City, Cincinnati, Buffalo, New York Jets and Chicago defenses will be reviewed and evaluated. In Part 3, the midseason offensive line review wraps up with a look at protecting Brady in the Denver game.